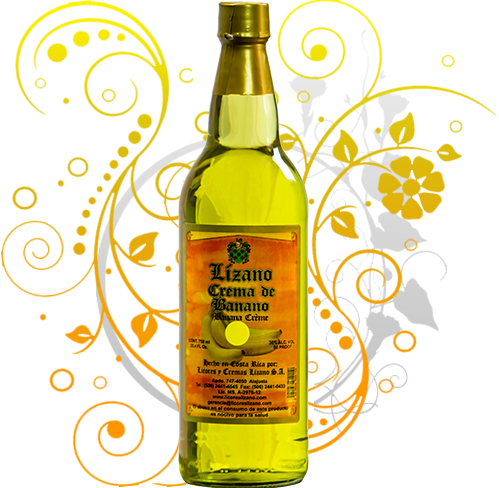 BANANA CRÈME | Licores y Cremas Lizano S.A.
It´s alcoholic content is 60 proof. Its exuberance and delicacy provide colossal and romantic dimensions proper of a turbulent flavor fabricated by the gods of the tropical Atlantic rain forest of Costa Rica. The aroma exhaled opens up the senses of an uncontrollable passion that comes from the Caribbean Sea. It is like the topaz of the low lands by its color, while it provokes an uncontrollable desire of a tropical dream. This entry was posted in Crème on 2013/09/25 by licoresliz.